Multi-step forms can be a great idea! By only showing a few inputs on a screen at a time, the form may feel more digestible and prevent users from feeling overwhelmed by a sea of form fields. Although I haven’t looked it up, I’m willing to say no one enjoys completing a ginormous form — that’s where multiple steps can come in handy. The problem is that multi-step forms — while reducing perceived complexity on the front end — can feel complex and overwhelming to develop. But, I’m here to tell you that it’s not only achievable, but relatively straightforward using React as the base. So, that’s what we’re going to build together today! The easiest way to create a multi-step form is to create a container form element that contains all the steps inside of it as components. 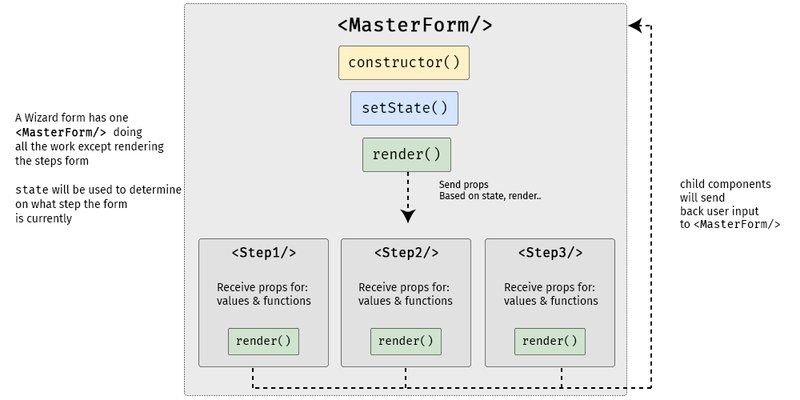 Here’s a visual showing that container (), the components inside of it (, , ) and the way states and props are passed between them. serves as the container while three child components inside of it act as each step of the form. State is used for storing data and user inputs. Component is used for writing methods and the interface. Props are used for passing data and function into elements. Instead of having one form component, we will have one parent component and three child components. In the diagram above, will send data and functions to the child components via props, and in turn, the child components will trigger a handleChange() function to set values in the state of . It’s one big happy family over here! We’ll need a function to move the form from one step to another as well, and we’ll get to that a little later. The step child (get it?) 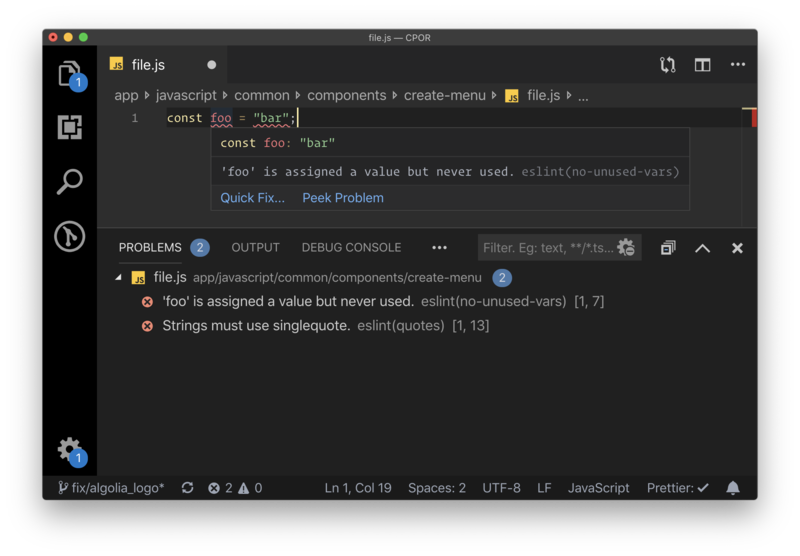 components will receive props from the parent component for value and onChange props. will supply both data and function into child components, and child components will pass user inputs back to the parent using its props. First, we’ll create the form’s child components. We’re keeping things pretty barebones for this example by only using one input per step, but each step could really be as complex as we’d like. Since the child components look almost similar between one another, I’m just gonna show one of them here. But be sure to take a look at the demo for the full code. Now we can put this child component into the form’s render() function and pass in the necessary props. Just like in React’s form documentation, we can still use handleChange() to put the user’s submitted data into state with setState(). A handleSubmit() function will run on form submit. Let’s make the parent component — which we’re all aware by now, we’re calling — and initialize its state and methods. We’re using a currentStep state that will be initialized with a default value of 1, indicating the first step () of the form. We’ll update the state as the form progresses to indicate the current step. OK, that’s the baseline functionality we’re looking for. Next, we want to create the shell UI for the actual form add call the child components in it, including the required state props that will be passed from via handleChange(). So far, we’ve allowed users to fill the form fields, but we’ve provided no actual way to proceed to the next step or head back to the previous one. That calls for next and previous functions that check if the current step has a previous or next step; and if it does, push the currentStep prop up or down accordingly. We’ll use a get function that will check whether the current step is 1 or 3. This is because we have three-step form. Of course, we can change these checks as more steps are added to the form. We also want to display the next and previous buttons only if there actually are next and previous steps to navigate to, respectively. That was the last step in this multi-step tutorial on multi-step forms. Whoa, how meta! While we didn’t go deep into styling, hopefully this gives you a solid overview of how to go about making complex forms less… complex! React was made for this sort of thing considering it makes use of states, property changes, reusable components and such. I know that React may seem like a high barrier to entry for some folks, but I’ve written a book that makes it a much lower hurdle. I hope you check it out! The post The Magic of React-Based Multi-Step Forms appeared first on CSS-Tricks.